Norton Children’s Hospital wins camp experience for cancer patients | Norton Children's Louisville, Ky. Earlier this fall, Northwestern Mutual held a contest for pediatric hospitals to host a hands-on camp experience for children. As a result of votes, Norton Children’s Hospital was one of 10 children’s hospitals to receive a $5,000 grant to bring the joy and feeling of camping to children unable to travel due to their health. The camping experience held in the Addison Jo Blair Cancer Care Center at Norton Children’s Hospital included fun experiences such as hallway kayak rides. 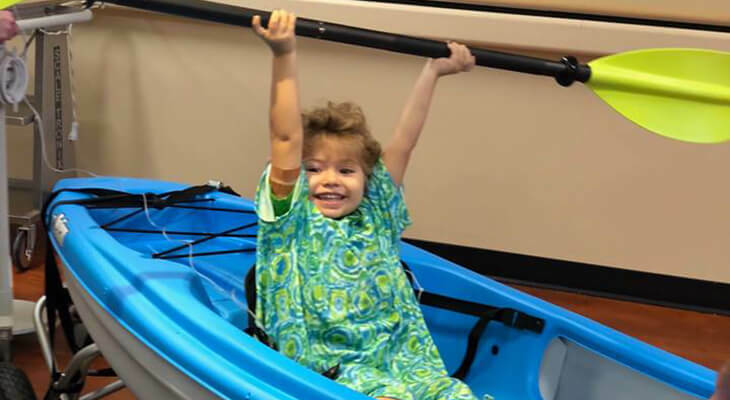 The kayak fun earned the hospital and Children’s Hospital Foundation an additional $5,000 grant from the Northwestern Mutual Foundation to support families whose children are undergoing cancer treatment. Support Norton Children’s Cancer Institute, affiliated with the University of Louisville. Launched in 2012, Northwestern Mutual’s Childhood Cancer Program was developed to find better treatments and cures for pediatric cancer while providing family and patient support and aiding survivors who struggle with the late-term effects of treatment. With the help of its employees and financial advisors nationwide, the program has contributed more than $20 million to the cause, funded more than 240,000 hours of research and leveraged nonprofit partners — including camps and retreats — to help more kids and families live life to the fullest.